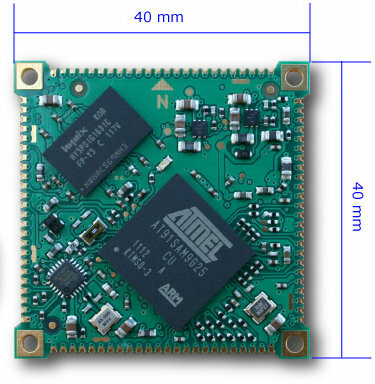 ACME System, an Italian company specializing in low-cost microprocessor boards, has designed the Aria G25, a tiny system-on-module (SoM) based on Atmel SAM9G25 for Linux embedded devices, that will be available in August and sell for 24 Euros (128 MB RAM version) and 29 Euros (256 MB RAM). The company will provide a Debian Linux distribution with Kernel 2.6.39 on bootable microSD once the board becomes available in August. Since it’s using Atmel SAM9 processor, there should be plenty of Linux resources and community support available. ACME Systems also provides support via Google Groups. The company appears to have a pretty good developer documentation, and released schematics (PDF) and mechanical design files for earlier projects, so we can probably expect the same for Aria G25. Currently, the board would be only useful for hardware engineers, because a carrier board is not available yet, but some evaluation boards are at the design stage. You can find more information on ACME Systems Aria page.